10°C, brisk NW, grey sky and the rain has finished for now. I rode Cyclocross with MapMyRide+! Distance: 19.3mi, time: 01:41:30, pace: 5:16min/mi, speed: 11.4mi/h. Took a familiar route on canals and disused railway tracks. For variety, there are side tracks that are rideable including this one in the photo. It’s a rail bridge that is closed off, rather crudely with tree trunks. You can see over if you climb up, but there is only farmland beyond. This track looks like trail bikes have hewn a route in footpaths. They undulated so that it was almost possible to propel yourself along by pushing the bars up and down like a kid’s rocking horse. Finding places like this is the great thing about cyclocross. That ride makes the week’s total 189 miles. I don’t feel that tired either. That means my fitness is good. 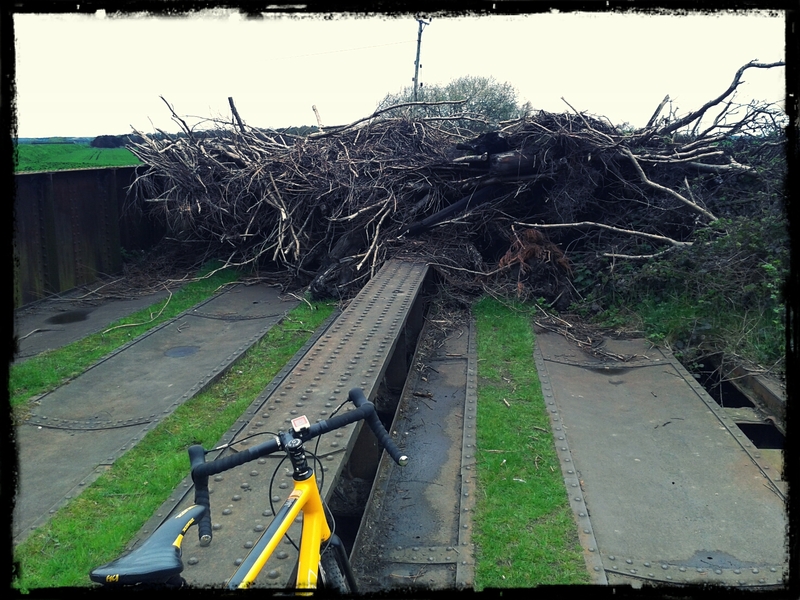 This entry was posted in cyclocross and tagged disused railway tracks, Gravel. Bookmark the permalink.